So you want to drive yourself to Lake Tahoe. There are 2 ways to get to the Lake Tahoe Resort Areas. 1) You can drive yourself. 2) You can take a shuttle from the airport. The driving directions to Lake Tahoe are below. Follow U.S. Highway 395 S to Carson City. Through Carson City to the junction of Highway 395 & U.S. Highway 50. Follow right-hand bend on Highway 50 up Spooner Summit. Continue on Highway 50 to the Nevada / California state line. California access is at the gondola in Heavenly Village on Highway 50 and also via Ski Run Blvd. to the California Base Lodge. Follow U.S. Highway 50 East to junction of U.S. Highway 89 North. Continue on Highway 50 making right hand turn, following the bend in the road. California access is at the gondola in Heavenly Village on Highway 50 and also via Ski Run Blvd. to the California Base Lodge. Follow Interstate 80 East to Sacramento. Continue on I-80 until the junction of U.S. Highway 50 East. Follow U.S. Highway 50 East to the junction of Highway 50 and U.S. Highway 89 N. Continue on Highway 50 making a right hand turn, following the bend in the road. California access is at the gondola in Heavenly Village on Highway 50 and also via Ski Run Blvd. to the California Base Lodge. Follow Interstate 680 North to Interstate 580 East towards Oakland and Stockton until Interstate 205. Take Interstate 205 exit towards Tracy and Stockton. Drive approximately 12.5 miles and take the Interstate 5 North exit. Take I-80 BR/US 50/CA 99 RAMP towards San Francisco and South Lake Tahoe. Stay straight on Highway 50 E until intersection of Highway 89 North. Continue on Highway 50 making a right hand turn, following the bend in the road. California access is at the gondola in Heavenly Village on Highway 50 and also via Ski Run Blvd. to the California Base Lodge. ! Follow U.S. Highway 395 North to Bishop, CA and then to Minden, NV. At the intersection of State Route 207 (Kingsbury Grade), turn left. At the top of Kingsbury turn left on Tram Way Drive and drive approximately 2 miles to Stagecoach Lodge. Or, after starting the descent on Kingsbury Grade, turn left on South Benjamin and drive approximately 1 mile to Boulder Lodge or continue on Kingsbury Grade to the Intersection of U.S. Highway 50 West. California access is at the gondola in Heavenly Village on Highway 50 and also via Ski Run Blvd. to the California Base Lodge. Take Interstate 80-East to Truckee, California (about 200 miles from San Francisco). 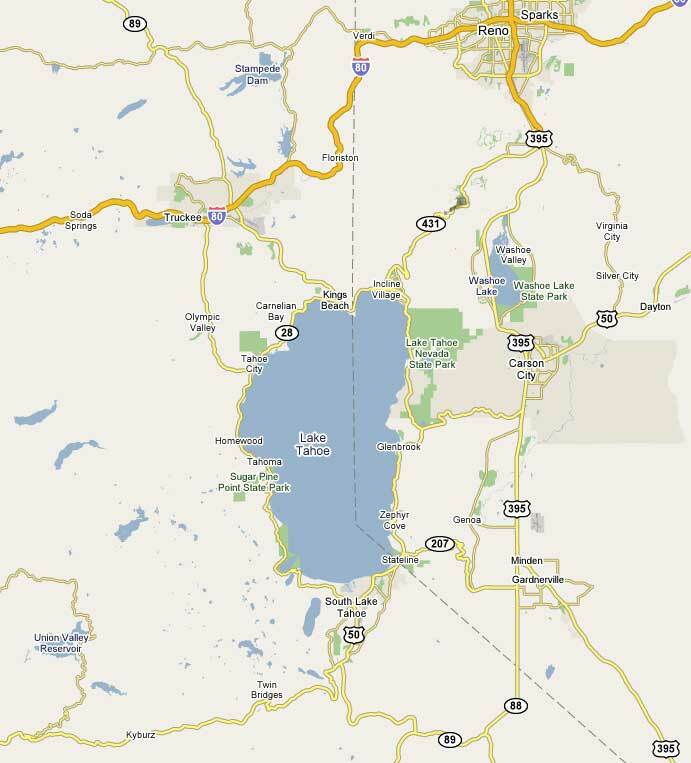 At Truckee, take the State Route 89-South exit, drive 5 miles. You will pass Olympic Village Turn-off for Squaw Valley and then head toward Tahoe City. 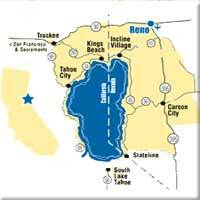 Take Interstate 80-West to Truckee, California (about 45 miles). At Truckee, take the State Route 89-South exit, drive 5 miles into Tahoe City.